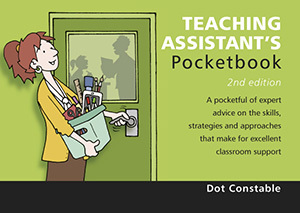 Teachers’ Pocketbooks have generously provided TA Focus with 10 copies of The Teaching Assistant’s Pocketbook by Dot Constable. To win one of these books, all you have to do is ‘leave a reply’ at the bottom of the page with the reason you have become (or intend on becoming) a Teaching Assistant. You don’t have to give your real name, but please give a valid email address. Competition Terms & Conditions below. 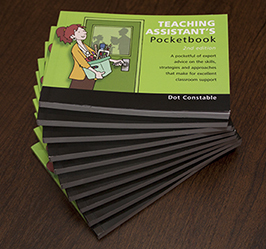 The Teaching Assistant’s Pocketbook is one of 40 Teachers’ Pocketbooks available from Teachers’ Pocketbooks at £8.99 + p&p! The closing date for all entrants is 1st March 2015. We will notify ten winners, by email, after the closing date, who will receive one copy of the book each. Our competition is open to UK residents only and winners will need to provide a UK address to send the prize. I became a teaching assistant to support the children that naturally get overlooked in the busy classroom environment, the ones without a voice that need someone to put a hand up for them, until they find the confidence to raise it for themselves. I became a teaching assistant because I love helping children learn and find it so rewarding to see them achieve! I became a teaching assistant because TA’s are the glue that holds a class together. I provide valuable support to the teacher and offer encouragement and help for children experiencing learning difficulties. Becoming a teaching assistant is a big commitment. TA’s need patience, dedication to the student’s well-being and a good understanding of childhood development. I enjoy getting to know the children, becoming part of their life and watching them learn and grow as the school year progresses. If I’m honest I became a teaching assistant for a variety of reasons. Some altruistic some not so: It fitted in with childcare (my daughter is in the school where I am a TA), I have travelled and worked extensively and felt I had lots of knowledge to pass on and inspire children, many people kept telling me what a great teacher I would make (didn’t fancy the workload of a teacher). I started in September 2014 and my only regret is that I didn’t start doing the job 10 years ago! I have recently become a TA for a few reasons. One is mainly due to my daughter starting school and I don’t have much child cover for the holidays. The next reason is having spent many years before having my daughter in a job I didn’t really enjoy, I spent the first year volunteering and discovered how enjoyable the job is. It is so rewarding seeing all the children achieving new things and it gives me such a warm feeling knowing I have played a part in guiding them towards doing so. I became a TA by default. I was working in social services as a meals on wheels delivery driver and was forced into redundancy. I phoned a few schools and discovered that a head wanted to interview me. I gained the post under continuous employment. With a complete career change, I immersed myself with courses and 12 years later I graduated with a foundation degree in learning support. Everyday brings new challenges within school life and I wouldn’t change a thing. Now how long did you say to Half Term ? I became a TA after reading the Lamb Inquiry into SEN. I can remember people I was at school with who, in hindsight, probably had learning difficulties or SEN. Much less was known about these things in those days and they were just the ” thick kids” and were more or less left to get on with it. They are my inspiration. I am not a TA. I am a teacher that feels that TAs are often under-valued and their roles misinterpretted. I am currently taking part in an in school initiative to highlight the role and value of TAs within the classroom. I’m becoming a teaching assistant because if the children are our future.. I want them to be the strongest, happiest, craziest future! And I learn more around kids than anywhere else! They open my eyes so much. I became a TA at my ow n(4) children’s school as I felt privileged to be able to see what they were learning. Now they have all left I still have that daily privilege of being part of different children’s learning journey’s. No two days are the same and I love being a mentor to the children, helping to build up their resilience and shoulder to cry on (for teacher and children!). In a nutshell im skint (rubbish pay) but very happy. I became a teaching assistant by accident, I was caretaker at a special needs school and I got yo know the children really well & I started to volunteer, to work in the classroom, then after a while I did my level 2 then level 3, and that was 9 years ago! And I STILL LOVE IT! All the children I work with are AWSOME!!!! The reason I intend to become Teaching Assistant. as volunteering in a school made me realise what a rewarding job I could do.